Our mission is to help you make complex technology simple and simple technology empowering. We employ science-based research methodologies. This ensures that our research findings are focused on delivering actionable and reliable insights with the proper concern for statistical power and reliability. We offer a wide range of research options focused on delivering the proper balance between data reliability and cost. Our methods and professional project management experience covers all major development models include sprint testing for AGILE. We are well known for the testing and optimization of complex products and systems. By complex, we mean any product or system which is business-critical and requires rapid response user testing and optimization. All usability testing research programs are managed by a certified human factors engineering professional (BCPE). In our 40+ years of experience conducting professional usability testing programs, we have developed extensive experience with many critical user populations ranging from COPPA age children to individuals of advanced age with severe medical conditions. We routinely conduct studies involving complex user populations ranging from business executives, millennials, teens, military and DOD staff, Wall Street traders, physicians, healthcare providers, families, and many other populations. Our participants are all recruited by independent agencies based on criteria developed by our firm. We are deeply experienced with formal protocol development, IRB submissions, and related coordination. In testing involving FDA related matters, we offer industry-leading access to testing populations with a wide range of medical conditions. Our methods and expertise cover a wide range of product and system categories. At the highest conceptual level we specialize in four forms of human-technology testing and UX optimization. Human-Computer Interaction (HCI) testing: We have deep professional expertise in testing screen-based human-computer interaction systems ranging from consumer e-com website interfaces to highly complex commercial software systems. Our expertise in this area includes extensive experience with mobile applications and related interfaces. Physical products testing: we have deep testing experience with physical products ranging from simple hand-held devices to large industrial machinery. It is important to note that many of our projects cover products with complex HCI interfaces. In these projects, we routinely test and optimize both aspects of such products. User Experience (UX) Optimization: our fourth area of specialization is whole system user experience optimization. These projects involve investigation of a user’s entire engagement with a given product or service. These projects routinely focus on investigation and identification of overall user experience performance and areas of meaningful optimization. We do not fill conference room with sticky notes but alternatively employ rigorous anthropological research methods combined with business process modeling. Over 30 years conducting usability analysis: We are fluent in all critical usability research methods and pioneered the use of several of these methods in the U.S. in the early 1970s. In all projects, we employ the appropriate methods required to answer your complex business questions. Starting in 1976, we were the first U.S. consulting firm to create a testing lab and conduct research using this methodology. This method is effective in exploring high-level usability of products and services. 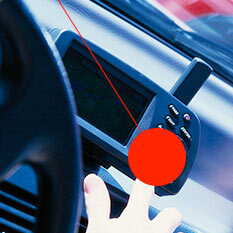 It provides visualization of user interactions based on a limited number of tasks. Your development team can view the entire process from behind a one-way mirror, providing compelling evidence of usability issues. Lab-based testing works well for identifying interactions that are having a universally negative impact on the user experience. Online large sample user testing lets your users access an interactive survey and complete tasks on your interface at their own home or place of business, 24/7. The statistical reliability of the large sample size helps you confidently make major decisions related to the creation or redesign of business-critical applications and websites. This method is exceptionally powerful when combined with a lab-based / eye-tracking study. We have executed complex formative studies across a wide range of medical devices covering hardware, software, drug delivery, surgical and imaging modalities. We have worked with large internal client teams as a highly experienced HFE subject matter and usability testing resource. We have created complex SOWs, protocol, and pursued related IRB approves, and are highly effective with complex, iterative, large sample formative studies based on AGILE development methods. We specialize in the design, approval management, execution and delivery of large sample rapid-response summative usability testing studies. MUS routinely delivers robust studies with 500-1000 respondents in compressed time frames. We are well known for the quality of our research methods and compliance-related performance for demanding clients facing complex FDA approvals. MUS is an approved and preferred vendor for leading biotech, pharmaceutical, and medical device manufacturers. We are fully versed in CFR 21 Part 11 compliance requirements and maintain research methods within compliance. It is well understood that complex product usability is a combination of users’ interactions with the product or system and the environment in which such interactions take place. MUS has extensive experience in the design and execution of complex usability and user engagement research related to complex medical and industrial environments. We employ well understood and industry proven research methods to identify and resolve usability issues that flow from a given operational environment where many factors are commonly at play. We have extensive experience with both cognitive and ergonomic environment audits and have executed such research for many leading corporations and government agencies. Our reviews are undertaken by certified human factors engineering professionals and provide you with immediate feedback on critical usability and user experience issues present in your product or system. This methodology is a powerful method for structuring the thinking of the development team in terms of the dimensions that impact user performance and satisfaction. This methodology works well for providing professional usability feedback during rapid AGILE-style development programs. With the formal approval of the COPPA by U.S. Congress, the requirements related to the design of websites for children under the age of 12 took a dramatic turn. If you are developing web-based services of any type and your user base is known to include COPPA-age users, you must adhere to a more rigorous set of standards when designing your site and testing the site with COPPA-age users. MUS has extensive experience with special requirements related to testing a wide range of products and websites for this specific user profile. We are well versed in the special issues surrounding safety, confidentiality, and compensation related to COPPA testing. We are also experienced with the design and conducting of group focus sessions and related parental participation for this age group. 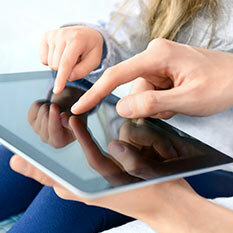 Our specialized experience includes a focus on information access UI design and parental controls related to COPPA-age users. We have extensive experience in the design and testing of IFU (instructions for use) and user guide systems. 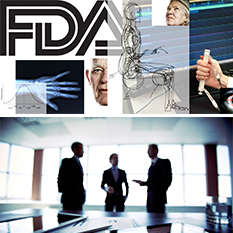 We work with clients to ensure that FDA guidance and mandated human factors engineering performance criteria are met for IFU and RG (reference guide) components of medical and drug delivery devices. We are especially adept at consumer-facing IFU design, testing and/or optimization. MUS provides subject matter expertise, HFE audits, content analysis, information design, IFU design, visual design analysis, cognitive task analysis and formal usability testing during development to confirm HFE performance is verified and documented. As medical devices become more complex and the general user population becomes more diverse, there is a demand for the design and testing of compressed IFU content in the form of Reference Guides (RG). We have specialized research methods and document protocols for the design, testing, and validation of RG materials. MUS provides subject matter experts, HFE audits, content analysis, information design, visual design analysis, cognitive task analysis and formal usability testing during development to confirm HFE performance is verified and documented. This method is highly effective when used with business-critical applications related to the creation or redesign of large or complex websites, web applications, and preparation for selection of new CMS systems. This methodology examines data files covering structured and unstructured responses of your customers or users. This process can also profile the relative effectiveness of your various document types and interfaces by determining how well-written and well-formatted your existing content is, based on the needs and expectations of your primary user profiles. This methodology provides deep insight into unstructured and structured user-generated content, such as message boards, blogs, forums and fixed document types. This methodology creates detailed behavior profiles and knowledge maps of an entire system’s content structure. We employ ethnographic and field research as targeted studies involving a smaller number of users to develop a comprehensive understanding of how customers engage with technology and systems on a daily or even weekly basis. This methodology follows users during their entire daily life, recording observations for the specific purpose of identifying unmet needs and areas of innovation that can only be discovered by a detailed recording of user behavior in their natural living and working environments. A primary business problem all large media companies face today is how to successfully migrate their traditional media properties to the interconnected and increasingly transparent delivery platforms of TV, web, mobile, and virtual. We have worked with the world’s most successful media companies to design and execute complex, cross-platform usability and user experience studies that address this difficult customer engagement problem. Our research methods have proven effective in helping major media companies understand and optimize their migration to successful new media business models. In complex products and systems, there is often a mismatch between user expectations and usability performance. These issues are often revealed during the execution of formal usability testing. However, the actual root cause of such misalignment is not usually revealed at the level of specificity required to rapidly make changes to the UI design that result in dramatic improvements in user acceptance and overall usability. Therefore, MUS offers clients a specialized service linked to usability testing that provides your development team with a reliable cognitive model of the interface as tested in conjunction with a detailed description of the relationships between UI design and the users’ higher-level cognitive processes. This expertise allows for the identification and resolution of problems in the UI design that map objectively to how users think about, learn and interact with your product or service. Cognitive modeling is a well understood formal methodology employed by MUS in a wide range of projects. Understanding your critical user profiles (personas) is critical to understanding how to create and support a successful product or service. For more than 25 years, we have created complex user profiles for a wide range of products and services, ranging from personas for cancer patients to brokers executing trades on the floor of the New York Stock Exchange. In all of these projects, we employ a combination of professional user testing, observational research, and interview methodologies to develop interactive persona solutions that combine the latest data with the most appropriate and reliable research methods. We have an international reputation for creating and formalizing advanced testing methodologies that offer insights and actionable recommendations that go well beyond what is normally provided by standard user testing programs provided by others. The following is a brief description of methods we combine to produce robust research into the user engagement and usability of your product or service. 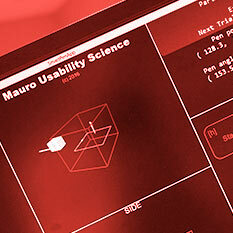 The following advanced testing methods were developed by MAURO UX LABS. Over the past decade, electroencephalography (EEG) technology has undergone a massive reduction in terms of cost and setup complexity. This has led to the introduction of a wide range of lower-powered EEG systems that offer data on cognitive processes with varying levels of reliability. The use of EEG in design research has been limited and, when executed, of often questionable quality. 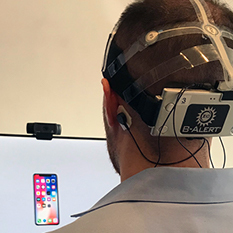 Recording the electrical activity of the brain at the surface of the scalp using EEG is an advanced user testing methodology that requires high levels of formal understanding, reliable hardware, and robust software for analysis and visualizations. 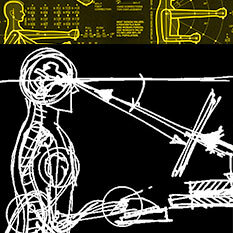 Prior to introducing EEG methods into our suite of design research tools, MUS executed an extensive and detailed analysis of EEG hardware platforms and software data analysis systems to determine if such systems offer the proper balance of cost, signal reliability, data aggregation and statistical analysis. With this data, we have structured our EEG research methodology to address design research questions that focus on cognitive workload, valance (approach/avoidance) and engagement. We have conducted proprietary analysis using EEG systems and available research literature to determine objectively where EEG methods provide unique insights above what we can gain from our other neuroscience-based methods. 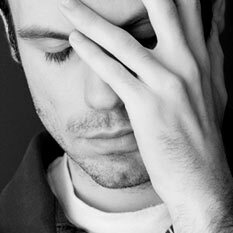 A benefit of EEG is that it can measure cognitive and affective responses in the absence of a behavioral report or even subjective awareness. A critical fact to keep in mind is that an EEG testing system is only an effective research tool if the system is configured, maintained and calibrated by trained and experienced research professionals. All MUS research staff that design studies, set up systems, calibrate and run EEG studies have advanced degrees in fields such as psychology and neuroscience with extensive professional experience and academic training in a wide range of EEG modalities and data acquisition platforms. We know from experience that EEG methods can add a robust view into individuals’ high-level cognitive functions as they interact with and respond to technology-based products and systems of many different configurations. However, EEG is a testing modality that currently demands the expertise of trained neuroscience professionals who understand objectively when and how EEG data is beneficial. MUS has this capability. Pharmaceutical companies can now have their new drugs rejected by the FDA based on how usable and understandable the delivery device and labeling is for the intended patient population. This new factor has for the first time placed professional usability testing and human factors engineering at the core of successful drug development and market acceptance. MAURO Usability Science (founded 1975) has completed a four-year development effort focused on providing leading drug device development groups with a robust new suite of highly focused and powerful new testing methods designed to meet FDA human factors guidance. These new techniques provide multi-dimensional and scientifically valid data on patient interactions with the entire drug delivery patient experience. Select MORE below for a detailed review of benefits and functions. The new MUS methods are effective in resolving the complex problem facing companies planning to release bio-similar drugs that are required to meet the new FDA Threshold Guidance. Within the field of professional human factors engineering science, this new FDA Guidance is well understood to be a potentially serious and costly factor in securing FDA approval. The new MUS system can provide multi-dimensional and scientifically valid data on patient interactions with the entire drug delivery experience. This new capability allows development teams to resolve use errors by properly allocating enhancements between hardware design, labeling and HCP moderated training. Optimizing the entire patient experience is the cost-effective approach to gaining FDA approval. This approach allows development executives to allocate HFE improvements to that portion of the total user experience that has the most significant impact on reducing risk and reducing development costs. The MUS system is used to determine the usability of the following key components of the total patient experience. We know from over 40 years conducting professional usability testing and human factors research that detailed human factors specification for patient populations that have unique limitations is not available in the existing research data. Missing research data makes drug delivery device usability testing more complicated due to a lack of capabilities for target patient populations. This lack of objective data on patient limitations does not reduce a corporation’s duty to create a usable product under FDA guidance. Such missing data includes but is not limited to the following key variables. Contact Email Charles L. Mauro CHFP For more information on our FDA Guidance usability testing and human factors engineering system. It can be difficult to understand how consumers may respond to specific content, branding, advertisements and other forms of promotional material. By utilizing advanced methodologies including eye-tracking, micro-facial expression analysis, galvanic skin response (GSR), and subjective response surveys we can gain powerful insight into both the psychological and physiological response that consumers have to these types of materials. These data streams can be collected across various types of media including static advertisements, dynamic advertisements, branding variations, or any other screen-based material to test respondent reactions. Data can be compared across variations of a single stimuli (i.e. color, size, duration of presentation, etc.) to determine which version generates the greatest positive feedback and vice versa. In combination, these methodologies have the ability to identify key impact factors that cannot otherwise be captured. How the methodology works: Participants undergo structured presentation of isolated branding-related content or larger branded webpage concepts. 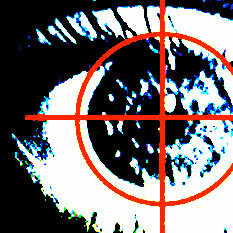 Eye-tracking will be used to examine relative salience of and engagement with such content. Micro-facial expression analysis will be used to capture the expressed emotional responses of users viewing or interacting with the content. 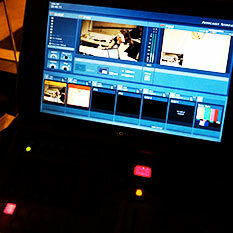 GSR will be utilized to measure the intensity of emotional responses to such content. EEG may be employed to inform higher-level cognitive processes required when using the website or application, such as cognitive workload. Subjective response will be employed to verify insights gathered from the above-mentioned data streams, as well as assess communication of intended branding attributes and messaging. One of the most complex usability and UX optimization research problems is developing robust insights into how customers or users navigate and make decisions in large 3D spaces like pedestrian way-finding in cityscapes, museums, retail stores, and a wide range of other environments. As a means of specifically addressing this problem, we have developed a specialized methodology known as Environmental Navigation Eye-Tracking or ENET. 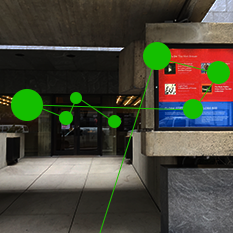 The system is designed to produce robust insights into how visitors to large environmental spaces interact with, navigate and make decisions as they move about freely. The ENET methodology employs state-of-the-art eye-tracking technology/glasses interfaced with a data collection device the size of a typical smartphone. The system offers unencumbered navigation of large 3D spaces and the tracking of a wide range of visual information seeking behaviors. What makes our ENET system different: Head-mounted eye tracking has been utilized in a number of settings by agencies that tend to have minimal understanding of the underlying technology and cognitive processes. This lack of understanding routinely leads to studies which are underpowered and that report incorrect data. We were the first usability research firm in the US to employ eye-tracking systems on a routine basis (1976). We have a deep understanding of how to design studies that produce reliable results based on extensive understanding of the strengths and limitations of head-mounted eye tracking technology. Our statistical analyses and data analysis processes have been designed to produce the most reliable data possible from these new testing methodologies. The ENET methodology has been utilized in studies requiring high levels of research rigor including work executed for leading pharmaceutical companies related to FDA device submissions. Other applications include pedestrian way-finding and traffic warning systems, driver cognitive workload, museum navigation studies and others. How the methodology works: Participants in our ENIT studies are fitted with specialized glasses that can be fully corrected for vision requirements so that there is no loss of viewing acuity. The data capture glasses are utilized in conjunction with a study design created by our professional staff which involves respondents undertaking various tasks just as they would when navigating a large-scale 3D environment for the first time or during a repeat visit. Respondents are entirely free to navigate without interruption or hindrance from the data gathering technology. Many business-critical development programs today can benefit from advanced emotional user response testing. We offer best in class emotional testing methodologies that can provide deep insights into your users or viewers emotional response to a wide range of design-based stimuli. Our emotional response testing methods rely on scientifically valid psychophysical measurement systems designed to produce highly actionable insights on how your users are responding to a wide range of products, printed materials, advertising content and software-based interaction frameworks. We own, maintain and continually upgrade all critical emotional testing systems including micro-facial expression analysis, EEG, EMG and GSR modalities. These systems can be combined to produce key insights into cognitive workload and related impact on user emotional response to all manner of programmed stimuli. Our emotional state tracking systems are integrated into a common data stream with advanced eye-tracking data capture technology and can be integrated into other data streams to provide a robust parallel view of user response to your creative content before, during and after implementation. We work directly with leading hardware and software vendors to develop specialized data capture systems for critical industry verticals including medical products, entertainment, advertising, package design, information content optimization and new product development for both hardware and software applications. For clients who require robust consumer preference testing, we offer specialized testing options including paired, replicated and repetitive case testing, conjoint and multinomial / multi-selection testing. Our research team is highly experienced with Panel / longitudinal testing, data analysis, including fixed and random effects modeling over time focused on learning decay, growth and sustained performance. Our research team is also experienced with partial-factorial and full-factorial research designs (for saturation / large multivariate choice testing. Our expertise also includes sample size determinations such as stratification, clustering, and other methods to obtain maximum value from small (or expensive) sampling frames. The MUS director of advanced consumer testing has authored major texts on advanced study design and teaches at Columbia Business School. For usability and UX optimization studies that require a detailed understanding of how a given design or series of designs are manipulated in the 3D space, we employ proprietary and industry-leading 3D spatial tracking methodologies. When combined with EMG-based research, these methods provide you with unprecedented insights into user engagement with hand-held and hand-manipulated devices across a wide range of product categories. For projects which require an understanding of the physiological effort required in the successful manipulation of a product or device, we offer a robust and industry proven testing methodology utilizing electromyography combined with physical force measurement. 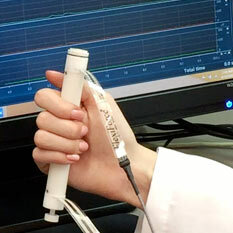 This specialized testing method utilizes the electromyographic potential of major muscle groups involved in manipulation of products ranging from auto-injector drug delivery devices to large-scale industrial equipment. Our EMG methodology is often combined with 3D spatial tracking and Newtonian force measurement systems. We have utilized EMG-based methods for more than 40 years and have a strong theoretical and technical understanding of when to apply this powerful methodology to help you optimize the UX performance of a product or system. The overwhelming number of eye-tracking studies executed in usability testing sessions today are executed improperly and often report findings that are incorrect. 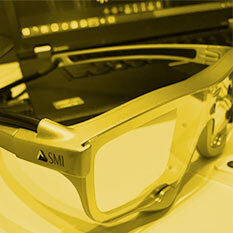 We were the first UX research consulting firm to utilize formal eye-tracking methodology in 1975. We own, maintain, and manage our own eye-tracking systems and work with leading academic and research professionals to conduct robust, properly powered studies that help clients define complex problems related to visual scanning and cognitive processing of visual information. We have a strong theoretical and practical understanding of eye-tracking and related applications including modeling of complex cognitive workload factors. Our methods are especially attuned to the evaluation of the appearance of products, package design, complex instructions and the design of screen-based interfaces. The forces that your users exert in the operation of your product are a critical aspect of how they rate the overall UX design. Forces are well known to impact judgments of overall interface quality, skill acquisition, and peer recommendations. We have executed studies ranging from the forces required to open a package of drug delivery devices to button forces on touch screens for smartphones. Our methodology utilizes a robust and industry proven force measurement systems that are entirely portable and wireless. This allows for the instrumentation of almost any aspect of the consumer’s interaction with a product or system. Our systems are designed and maintained to the highest levels of calibration and data production performance. Force measurement is often combined with EMG-based data gathering to produce robust UX data picture of your customer’s interaction with your product. The physical appearance design of your product, website or UX service offering has become one of your essential intellectual property and brand-building assets. Yet appearance design and visual style are far more complex to measure and optimize that most realize. For projects where you are basing major investments on the appearance design of a business critical product or service, we offer a robust visual design testing methodology, which combines psychometric scaling systems, combined with eye-tracking and physiological/neurological sensing modalities. This combination of methods provides you with not only reliable and appropriately powered data but complex factor analysis covering salient visual design attributes critical in optimizing the visual and aesthetic design of your essential product or service. Government research indicates that approximately 80% of all workplace injuries, which result in job loss and sick leave, are associated directly with ergonomically related defects in the workplace or workplace tools and workstations. To mitigate such problems we offer a robust and industry-proven workplace ergonomic optimization toolkit and associated ergonomic optimization research methodology. We have conducted formal workplace audits in a wide range of corporate settings ranging from executive office suites to high-capacity production line workstations. We have received major awards for ergonomic optimization methodology development and workplace optimization. These same ergonomic optimization methods are frequently employed in the design, testing and updating of stand-alone products across many industry sectors. The single most important UX design objective for any product or service is to make certain that the solution is to learn not necessarily easy to use. To a great extent, the ability of your user to rapidly acquire the necessary skills, rules, and knowledge required for them to be quickly productive is at the heart of true UX optimization. Thus testing and optimizing skill acquisition and understanding learning decay (how fast they forget how to use key features) is well understood to drive early acceptance, feature utilization and peer-recommendation. We offer you a highly structured and statistically robust methodology based on the latest thinking in mental model development. The testing methodology has been utilized by leading international pharmaceutical companies and leading high technology entities in the creation of systems which are easy to learn and minimize learning decay. As data-intensive and complex mobile devices enter our utilization patterns certain ways in which we deal with the external world become attenuated. A central question in this transition is the extent to which our inwardly directed attention (interacting with a mobile device) impacts our situational awareness. This is a non-trivial question as we have seen traffic deaths associated with texting expand dramatically. This problem is sufficiently complex and so important that it requires a formal methodology for assessing the redistribution of cognitive assets between portable hand-held or wearable devices and the environment in which we navigate, make decisions, take risks and interact socially. To address such research questions we offer you a structured methodology for investigating the impact that your technology may or may not have on the situation awareness of those who use your technology. This methodology which combines various testing methodologies including eye-tracking, cognitive modeling, ethnographic observational research and psychometric testing provides you with deep insight into how cognitive resources are being allocated by your users in the real world as they interact with your latest technology. Our testing system has been utilized on projects ranging from assessing pedestrian behavior when using mobile devices to the layout and optimization of robotic assembly tasks within a traditional assembly line. In addition to specialized eye-tracking discussed above, we routinely deliver studies to leading clients utilizing a fully portable eye-tracking methodology. In these studies, we employ industry-proven eye-tracking glasses which allow the research participant to navigate any environment from retail stores to traffic cross-walks without interference or restrictions. 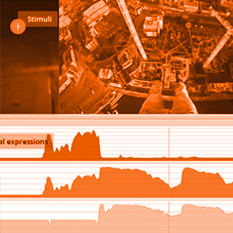 This methodology allows for the real-time documentation of your customer’s visual scanning behavior as they undertake scripted tasks, navigate complex environments, drive or otherwise interact with vehicles or machinery, make complex retail purchases or interact with portable devices and apps in real time. Our specialized eye-tracking glasses can be fitted with custom corrective lenses so that individuals are free to participate in our studies without concern for their own corrective glasses. UX optimization on a broader scale is about understanding the core needs, limitations and expectations of users as they interact with your service or product across its entire life-cycle. It is well understood that gathering such data, analyzing that data and providing actionable insights is a complex and time-consuming process which must be governed by science, not design methods. We do not fill conference rooms with sticky notes but alternatively apply robust methods from the human factors engineering and anthropological sciences to help you understand the total user experience optimization (TUXO) of your customers. We offer you a highly structured, data-driven research methodology that is customized for each TUXO project. Our methodology has been utilized to investigate and optimize entire systems and communities ranging from the world’s largest international refugee NGO to the military recruit intake system for the Department of Defense. Other projects have focused on consumer products and medical service delivery as essential industry sectors where such methods are known to be essential. With the advent of low-cost VR technology and more advanced VR software, the world is about to experience a restart of the VR user experiences. For clients attempting to navigate this complex and for the most part amazing new dimension of UX design, we offer user testing and UX optimization methods which offer deep insights into the psychological and physiological underpinnings of VR user experiences. Our methods have been utilized to conduct the largest in-world avatar behavior tracking and socialization study ever conducted. We have applied our methodology to help clients understand the psychological engagement individuals have been their real-world being and their synthetic avatar personalities. We have conducted the largest study ever fielded investigating the impact of VR experiences on brand engagement and purchase intent with real-world products. Our methodology has been utilized on a wide range of demographic profiles ranging from COPPA age children, teens, adults and military personnel. In collaboration with leading experts in computer vision and subject matter experts from client conceptualized developed first computer-vision based gem inspection system designed to reduce visual fatigue and increase throughput related to selection and grading of high-value gems, pearls and stones. Coordinated development and testing of functional prototype and related performance verification studies. Executed complex, large-sample online study design, data collection and analysis of online giving behaviors for contributors to IRC causes. Investigated image attributes, online giving platforms, IRC web site and IRC image descriptors. Executed complex factor analysis and identified core attributes that lead to increased giving by high-value contributors in cause-based NGOs. Conducted formal heuristics analysis of existing complex screen-based asset trading and valuation system for use by large hedge funds. Identified decision-making and related task flows. Provided detailed design recommendations for improving overall user engagement and usability of the system. 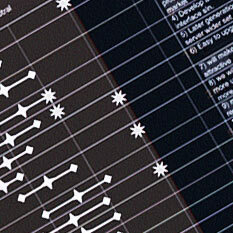 Data provided framework for redesign of UI based on existing software limitations. Executed large-scale online competitive usability and UX optimization studies focused on identification of key interaction attributes that were correlated with site engagement and repeat use patterns. Designed, programmed and managed online data gathering tools used in complex longitudinal studies of leading social networks. Conducted data and trend analysis on very large-sample online usability testing programs with 10,000+ respondents. For leading development teams of online computer games and virtual worlds conducted extensive design research focused on identification and categorization of interactive game attributes that can be correlated with user engagement. Provided framework for conceptual development, design and testing of online game to reduce risk of failure and improve engagement. FDA Human Factors Engineering Guidance Is Now Serious Business. Pharmaceutical companies can now have their new drugs rejected by the FDA based on how usable and understandable the delivery device and labeling is for the intended patient population. This new factor has for the first time placed professional usability testing and human factors engineering at the core of successful drug development and market acceptance. MAURO Usability Science (founded 1975) has completed a four-year development effort focused on providing leading drug device development groups with a robust new suite of highly focused and powerful new testing methods designed to meet FDA human factors guidance. These new techniques provide multi-dimensional and scientifically valid data on patient interactions with the entire drug delivery patient experience. Select MORE below for a detailed review of benefits and functions. The following are a series of special UX Optimization and Usability Testing application areas where we have developed deep experience. These are just a few of the many industry sectors where we have produced outstanding results for leading clients and startups. We have been deeply involved in complex medical device human factors engineering research, design, and testing for more than 35 years. Our experience includes design and execution of formative and summative usability testing programs for complex medical devices and software as defined under FDA guidelines. We are well versed in all related formal testing protocols as required by various regulatory agencies. 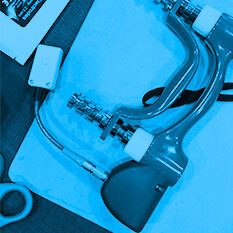 Our research experience includes complex recruiting and testing programs for large sample medical device testing. Based on our extensive experience in user interface design for both software and hardware applications, we are uniquely qualified to solve complex human factors engineering problems early in formative development. This experience saves you the expense of complex and costly redesign later in the development cycle. 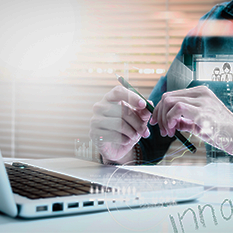 At MUS we employ AGILE and robust user interface simulations to model and test medical device design solutions during formative development phases. We are also experienced in the design and testing of all related procedures and instructional materials for complex medical device management and user training. We have extensive experience with many clinical modalities and patient/caregiver/HCP profiles. Senior partners of the firm also have extensive experience as expert witnesses in complex litigation related to utility and design patents and related matters. We have represented many of the world’s leading corporations as experts in product design, user interface design and human factors engineering. We are well versed in the all major aspects of intellectual property protection and litigation related to medical device design and use. It is generally well understood that the world of screen-based interactions of all types are rapidly migrating to presentation on mobile devices. This migration presents development teams with a special set of user experience design problems. Specifically, the ultimate usability of mobile devices extends across two domains: the physical ergonomics of the device and the interaction framework of the screen-based functions and features. We are uniquely qualified in both device ergonomics and user interface usability testing. Our experience includes usability engineering and UI design for mobile systems running at the heart of the world economy today. We offer clients robust and industry-proven mobile usability testing and UX optimization expertise, custom configured to meet your specific development objectives, lead times and user profile requirements. We employ specialized mobile device usability testing methods that can produce large data sets in short time frames, thus increasing the statistical reliability of data generated in usability testing programs. We have consulted for the world’s leading mobile device companies providing expertise in usability testing, UX optimization, and expert heuristics audits. Over the past 15 years, we have executed usability testing programs for several of the world’s primary markets and market makers, including major projects for the New York Stock Exchange, Goldman Sachs, Trading Technologies, Inc., Wit Capital/Soundview, and other leading financial institutions. We have financial trading systems experience covering all phases of usability research, including business objectives development, needs analysis, task analysis, trading floor ethnography, and cognitive modeling of high-risk decision making. We have developed usability testing programs for a wide range of profiles and have extensive experience analyzing and developing consumer online systems including home banking, trading, and financial planning. 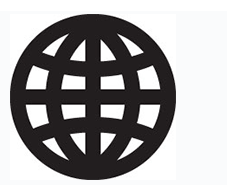 Our trading solutions are running at the heart of the world economy. A primary business problem all large media companies face today is how to successfully migrate their traditional media properties to the 4 interconnected and increasingly transparent delivery platforms of TV, web, mobile, and virtual. We have worked with the world’s most successful media companies to design and execute complex, cross-platform usability and user experience studies that address this difficult customer engagement problem. Our research methods have proven effective in helping major media companies understand and optimize their migration to successful new media business models. Online gaming and virtual reality are two of the primary forces of the “NEW” new media. Avatar-based interfaces allow customers to play in synthetic environments, creating a staggering opportunity for those who understand the psychological impact and the primary customer experience design challenges. 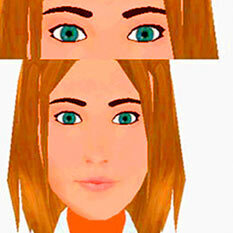 Effective and reliable research in these new virtual worlds and gaming interfaces drives success. At MUS, we have pioneered research programs for some of the largest gaming and virtual world commercial projects in recent history. Using these new methods for conducting research in gaming and virtual worlds, we have developed a deep understanding of the user and avatar behaviors and related functions that drive deep immersion and expand in-world social networking participation. Our research services have been used extensively to answer critical user experience questions related to how customers respond to gaming and virtual world interfaces. Understanding your critical user profiles (personas) is critical to understanding how to create and support a successful product or service. For more than 25 years, we have created complex user profiles for a wide range of products and services, ranging from personas for cancer patients to brokers executing trades on the floor of the New York Stock Exchange. In all of these projects, we employ a combination of professional user testing, observational research, and interview methodologies to develop interactive persona solutions that combine the latest data with the most appropriate and reliable research methods.